Turn any computer into a self-service Kiosk. Kiosk software securely displays your website or application and reduces maintenance time. Internet Kiosk software converts computer into self-service kiosk. It prevents hacking and downtime, blocks the system keys like Ctrl-Alt-Del, restricts access to the system, desktop, drives, folders and programs. You can use it to securely display your website or application, show marketing messages and advertisements, bill for Internet use, games or office applications, sell tickets for WiFi HotSpot around your kiosk, and much more. Kiosk software replaces system shell and blocks access to the Windows Explorer, drives, desktop and taskbar. It prevents access to the Windows system files, standard browser menus and prevents hacking and downtime. Blocks system keys like Ctrl-Alt-Del, Windows key, Ctrl-Esc and other keys that might compromise security. Compatible with Windows 7, Windows 8 and Windows 10 32bit and 64bit. Creates, configures and runs under standard (limited) Windows user account for maximum protection. This additional security level prevents user to delete any system files that are required for the computer to work. Hides and/or restricts access to specified drives to avoid anything getting deleted or tampered with. You can leave one drive visible where customers could save files, or you can show all drives but prevent user from saving or opening anything from these drives. Defines file and folder access rights to keep your computers safe. Configure desired access rights for each folder in your system: full access, read only, read & write, read & execute, or prevent access completely. Blocks specified application executable names and program options within applications. You can disable access to application options like Open, Save as, Properties. The same option can be used to exclude application from automatic closing on customer logout. Antamedia Kiosk software give you ability to control and limit printing over your Kiosk computer. Printer should be installed and set as Windows default printer prior Kiosk software installation . Antamedia Kiosk software works on any supported Windows OS and any hardware. This guide will help you install and configure Kiosk software on Windows 10 PC. Requires password for accessing the Kiosk Setup or operating system. Computer runs in a lock-down kiosk mode, until admin presses the hot-keys and enters the password. Prevents the user from accessing the Internet Explorer menus, replaces popups and all other options that can open system options. Secure Internet Browser provides provides complete browsing experience for the customer while reducing maintenance time. Limits browsing to specified URLs. For example, you can allow your company website, facebook login page and disable other pages. Automatically deletes browser cache and history of visited pages. Prevent saving cookies which reveal customer identity and leave traces of the kiosk usage. Kiosk software restarts Secure Internet Browser after inactivity and prepares kiosk for your next customer. Save on bandwidth costs and increase security by disabling file downloads, pop-ups, Java, ActiveX, scripts. 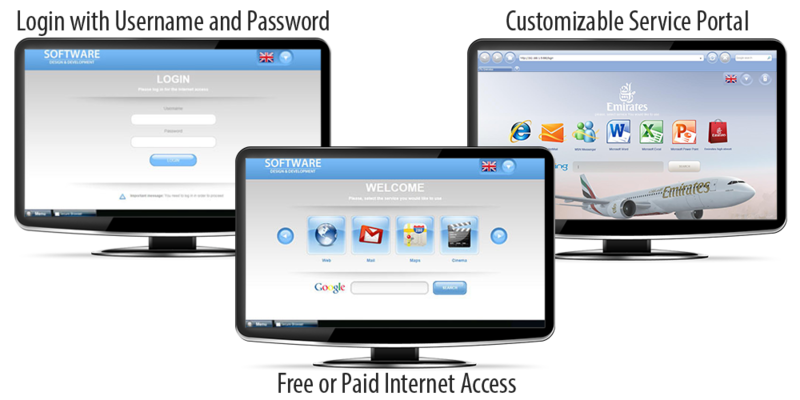 Easily block unwanted websites from being accessed on your kiosk. Select desired categories like adult, drugs, weapons, gambling, phishing, violence, virus infected etc. List contains 2.5M domains sorted in over 90 categories, with ability to whitelist desired websites. Payment Station helps you collect money from your customers using coin and bill acceptors. Software supports CCTalk protocol used by major hardware manufacturers. Save time and resources by allowing the customer to pay for Kiosk usage or WiFi HotSpot Internet access. The secure automated payment process lets you accept over 70 major internet payment gateways including PayPal. Create simple pricing like $5 per hour, or create complex price plans that are used to create tickets for returning users. Define available time, maximum daily time, number of logins and price for each plan. Limits number of open pages in tabbed Secure Browser, configures start pages that will automatically open in browser tabs, forces customer seeing desired content by hiding tab close button, allows only selected URLs to open in browser tabs. Easily change Kiosk Start-Page theme displayed in customer browser. 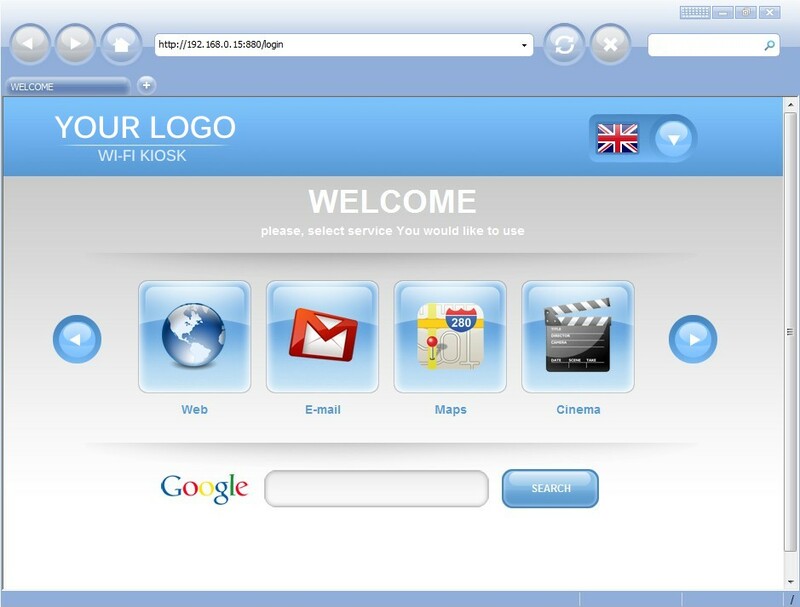 You can create your own multilanguage themes using white-label themes included with kiosk software, and include your own graphics and functionality. Customizable browser look and feel. Change color to blue, black, green, brown, select large browser buttons for touch-screen or smaller buttons to save space, show or hide URL address bar, search engine, virtual keyboard, close, restore, minimize buttons, turn on animation on the browser background, run browser full-screen. Make a great strong first impression with a start page that match the Kiosk purpose. Show a website landing page, open multiple tabs with their own custom URLs, or choose one of the predefined white-label start pages – airport, hotel, retail, beach, free use, kiosk login, pay and use. Create Windows-like Start Menu items with programs, games and folders. Customers may use these applications free or for a fee, while you do not have to worry about regular security issues. Creating menu is easy – create folders and drag and drop files inside. Change your logo, contact details, graphics and links to the webpages. Kiosk files are white-labeled and you can modify them to suit your needs and to match your corporate identity. Show notifications or advertisements by combining videos, images, webpages, flash animations. Choose one of the predefined layouts of the screen split in to the 2,3 or 4 parts, each configurable with different content. We can assist you or develop an entirely new theme for your business, interface your application with the Kiosk software, or develop new software that will run on top of the secure Kiosk shell. Please contact us for quote. Download and test Kiosk Software now! Kiosk software is created based on your requirements. To provide known Windows environment for end users with complete control of computer from your side. It easily scale from a standalone kiosk to a major Kiosk Chain with the same simple interface. Up to a 33% increase in revenue. At the same time 70% of customers using a kiosk instead of live help. With a a 35% reduction in customer wait and transaction time. Kiosk software is complex but simple for use application. It provide basic control of Free access over Kiosk computers but can also be used for a control of computers based on paid access using Credit Card module or Coin/Bill Acceptors. Depending from your needs. Connect kiosks to the same database server (which is free of charge) and share user accounts among all your locations. Account can be used to login on another Kiosk or WiFi HotSpot which can be installed even on the same computer. If you choose Internet Explorer over integrated Secure Browser, you will still have many configurable options to maintain good system stability and minimize ability for exploits. For example disable Open File, browser context menu, changes of security levels, etc. Offer your customers quick Email sending through the integrated Email client or help them choose and connect on their own Email provider like Gmail, Yahoo etc. Maintain and support unattended systems instantly without having to travel to sites. Access your self-service computers remotely and configure applications, troubleshoot, resolve issues, run updates, help customers, monitor suspicious activity. Save time and reduce the overhead and maintenance issues associated with sending files on your unattended computers. Transfer new updates, corporate branding files, xml configurations, content updates. Eliminate the need for keyboards with the integrated virtual keyboard. Your customers can display virtual keyboard when they need it and use a kiosk touchscreen to enter data. Who is Using Kiosk Software? Minimize staffing requirements and automate common tasks with applications. Popular uses are for airport and hotel check-in, concerts and fitness clubs, hospitality and sports events. Self-service reservations are popular for restaurant tables, golf course, spa centers where customer privacy matters. Self-service ticket dispenser helps you automate selling of the prepaid Internet tickets. It runs as a standalone service, or as an integrated part of the Kiosk. It collects bill, coin, credit card and PayPal customer payments and creates tickets which can be used on all kiosks or hotspots in your network. 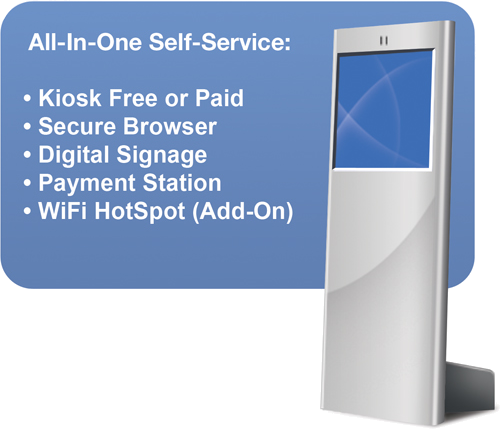 Expand service around your kiosk by installing Antamedia HotSpot and an access point. WiFi devices such as tablets, laptops, smart phones can utilize your services free or for a fee. Bill for Internet use by time, data transfer and offer different price plans for returning customers. Provide accurate product information, product ordering and guided selling to increase sales revenue. Show product comparison, how-to, and help customer easily find the product in your store. Accurate product information reduce returns and increases chance for additional accessory orders. Kiosk software runs on a standalone computer. If you are looking for multi-kiosk deployment, please check-out samples and contact us with your requirements for a custom solution. Kiosk software can run on any Windows PC – from Windows 7 up to Windows 10.